Prep for taxes lets you enter adjustments before filing taxes and helps ensure the accuracy of your clients' books. See all Balance sheet and Profit and loss accounts accessible in one view, for an easier way to work. All changes made (by all users) are tracked. Have full confidence that your tax filings are accurate because you can review the changes first before accepting the transactions. Plus, the setup to send information to ProConnect Tax Online is now better than ever. There are many other benefits and enhancements built into Prep for taxesthat will help you get your client’s taxes filed. 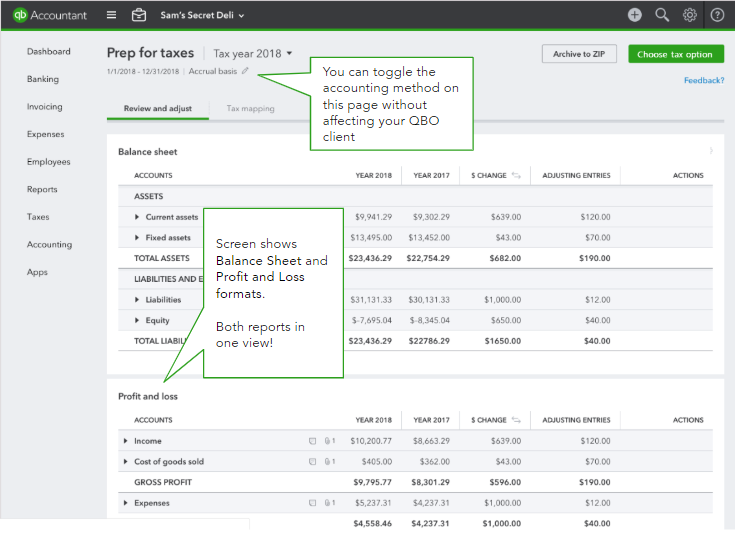 The Change list is a great tool if your client is also working in QuickBooks while you are, or if you’re part of a firm with multiple accountants working on the same tax returns. 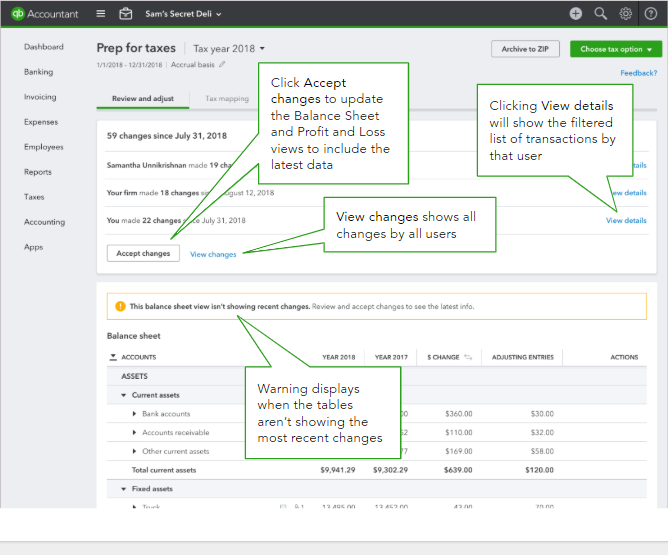 Notifications appear at the top of the screen when a change is made capturing all changes to the tax year since the last time you updated your view. Stay more organized by viewing the changes made by the user before accepting the changes. Clicking View changes takes you to a filtered list of all the unaccepted changes so you can confirm that you are ready to accept all the changes that were made since you last updated your view. Changes will not be incorporated into your Balance Sheet until you click Accept Changes, keeping you in complete control. New indicator icons, a year-over-year view, and accounts listed in a Balance Sheet format all help to navigate the Review and Adjust screen quickly. Actions column allows adjustments, notes, and documents to be included. You’ll now also see an icon to indicate a note exists or how many documents have been added. Note: The drop-down option to attach documents will not be active until the middle of February. If you need to retrieve old documents before then, use this link to access them. Please do not use the old Trial Balance for anything other than gaining access to old documents. After the attach document function is made available, all your old documents will transition over. A year over year comparison now displays side by side because the Review and Adjust screen displays the Balance Sheet view. Adjusting entries are easily viewed for each account. Adjusting entries reflect the work that you have done to the books, as only you as the accountant have the ability to mark a journal entry as an adjusting journal entry. The improvements to Tax mappings are all designed to help you save time and work through mapping accounts more effortlessly with added confidence that you are ready to file. You can verify tax lines that have been assigned and quickly locate any tax lines that haven’t been assigned yet. 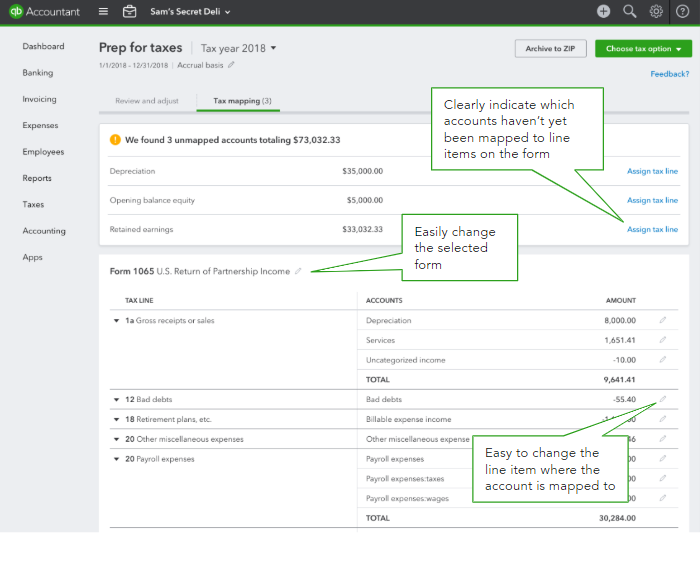 When assigning the tax line, you can now see helpful information about the account. You’ll also be able to save time when selecting tax line choices based on a word you started typing. 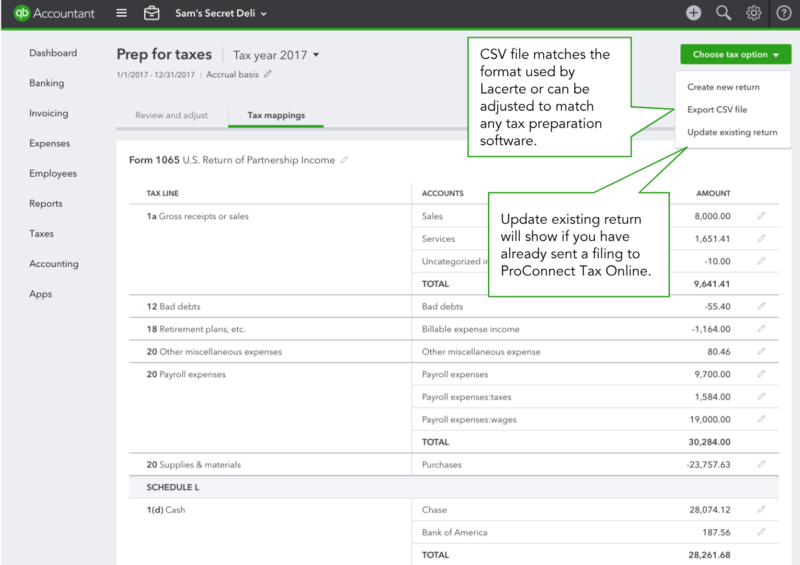 You’ll be able to tell whether a filing has already been sent to ProConnect Tax Online (PTO) or not because it will say, Update existing return. When selecting Export CSV file, it will match the format used by Lacerte. However, you can edit this file to match whichever tax filing program you are using. When viewing the tax form in PTO it will already be completed. All that is needed is a quick review, and then you’ll be ready to submit. If you experience Prep for Taxes not loading or an error that says something went wrong, you can clear your cache and Intuit cookies to resolve that issue.